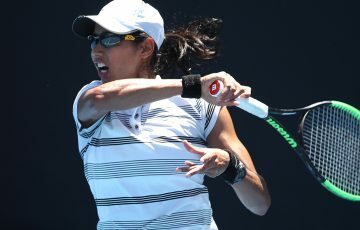 Fourth seed Arina Rodionova overcame a tough opponent in Jessica Moore to win their quarterfinal match in the Australian Open 2013 Wildcard Play-off 7-5 6-3 in hot and blustery conditions at Melbourne Park today. The wind wreaked havoc on the girls’ games, and in particular their serving ability, with the two often having to apologise to the other end for delaying their serves to get the toss right. Despite the straight-sets scoreline, the match did not begin in Rodionova’s favour with Moore capitalising on her opponent’s first service game struggles to claim a break and then hold her own serve to lead 2-0. 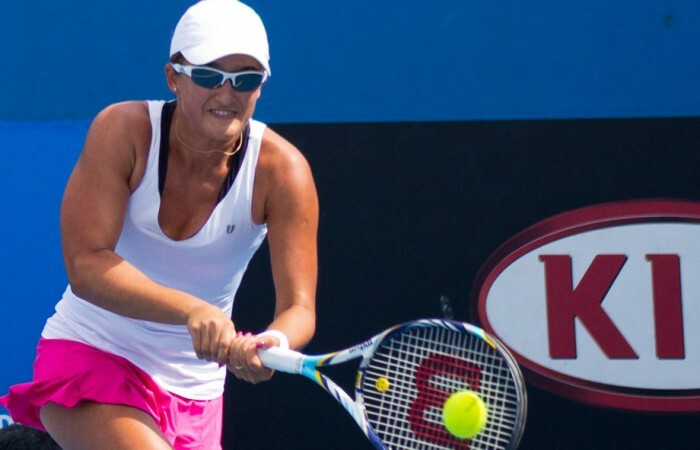 Despite being down a break, Rodionova continued fighting hard and searching for a way to play through the wind. She began playing smart tennis by moving Moore all over the court, trying to wear her down. Moore didn’t give up though, fighting tooth and nail to reach the ball and keep it in play. With another break point opportunity while leading 3-1, Moore managed to land a deep forehand on the line and take a commanding 4-1 lead. Moore’s next service game went awry, however, and at 0-40 down Rodionova sent a beautiful backhand down the line to reclaim one break. 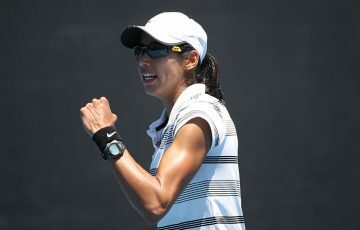 By this stage all momentum had moved over to Rodionova, who looked to have clearly taken on a new lease of life in the match, winning her next two service games. She then claimed her second break back with Moore serving for the set, levelling the encounter at 5-5. With a great support crew in the crowd to play off, Rodionova looked determined and hungry for the win, holding her next service game easily 6-5. Moore’s attempts to serve to stay in the match were foiled by a ripping backhand down the line that obliterated her early lead. Rodionova took advantage of the first of three set-point opportunities, forcing Moore to send her ball long as she sealed the set 7-5. Undeterred from the first-set loss, Moore comes back rejuvenated in the second set, taking another small lead by breaking Rodionova in the third game 2-1. It didn’t last, with Arina managing to reclaim the break to level in the sixth game of the set 3-3. The match turns into an intense encounter with both girls displaying their emotions on the court. Rodionova is clearly frustrated, screaming out constantly at her mistakes, whereas Rodionova disputes several line calls with the umpire. Rodionova takes full control of the set, however, and secures a break to lead 5-3 and serve for the match. She has trouble serving it out, moving immediately to 0-40. She is able to save all three break points with some strong first serves and at match point produces another great serve to seal victory. After the match Rodionova says she was relieved to be able to get a win in the hot and windy conditions, which didn’t allow her to play her normal game. Where she would normally be able to rely on her serve or a strong rally she said nothing really worked well for her today because of the weather. Having played in the first match of the day, Rodionova will use the heat for enjoyment this afternoon, cooling down and relaxing at the beach before her semifinal on Saturday, which will also be her birthday. She will play fifth-seeded Western Australian Bojana Bobusic who upset Australian Open 2012 Wildcard Play-off winner Ashleigh Barty in a three-set affair.